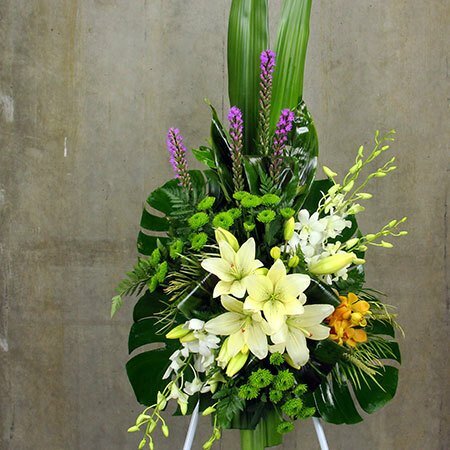 With creamy white lilies and Singapore orchids as its focal point, these lush funeral flowers are a contemporary floral design appropriate for displaying at memorial services (available with or without stand hire). Accents of fresh lime, bright orange and purple add a splash of colour, with large tropical leaves adding width and height. Order these funeral flowers via our online florist shop or call the team on 1800 66 66 46. *Please note: The pictured funeral flowers are exclusive to Sydney only. For funeral flowers delivered outside Sydney, the team will coordinate your order via an affiliate florist network to recreate our style, content and presentation as closely as possible. 2019-03-14 Service rating : Super service! Vanuit Nederland een bloemstuk besteld voor uitvaart in Australië. Uitstekende communicatie gehad! Alles op tijd bezorgd en het bloemstuk was naar verwachting, prachtig! Product : Prachtig bloemstuk voor uitvaart!